Welcome to Gaming Club, the online casino that ensures thrilling, fully-immersive action is not a pipe dream, beyond the reach of Kiwis. Rather than focusing on any one aspect of the kind of online gambling NZ loves, we take a holistic, integrated approach. The experience is one-of-a-kind, and it is ready and waiting for you! We love the entertaining side of gaming as much as you do, but we do not let it distract us from the other needs of players in New Zealand. Our casino online is no glorified gaming hall; it is one at which you get everything you expect from a prestigious establishment, and a whole lot more. Are you ready to embark on new adventures with us? Gaming Club was launched in 1994, and is arguably the world’s first and longest-running online casino. With more than 20 years’ experience under our belt, we know what we are doing – and, like a fine wine, we’re simply getting better with age. Our quality offerings are not limited to being enjoyed on your computer. 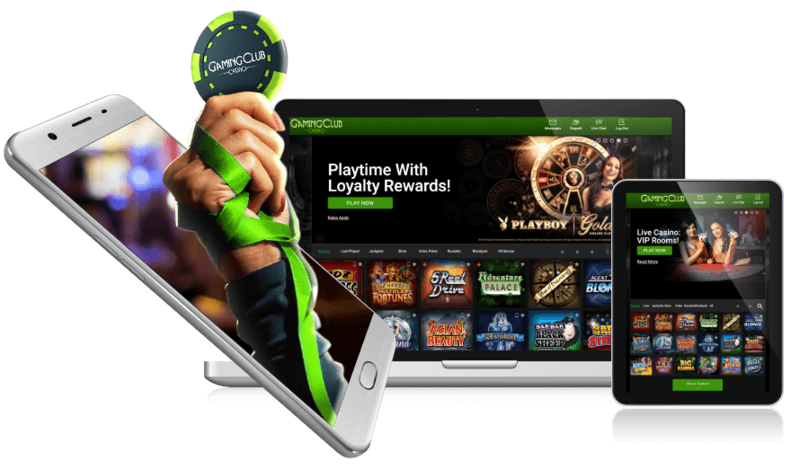 Our mobile casino, chock-full of the hottest pokies, Blackjack, and other games, as well as all the other luxurious things we have to offer, makes gaming on the go easy, convenient, and secure. If you want to take advantage of the best online gambling NZ has ever seen, you can. It’s as simple as that! Endorsed by eCOGRA, we are licensed and regulated by the Malta Gaming Authority. We are committed to fair play, and to player security. Pokies, a Kiwi firm favourite, are in abundance. Enjoy gut-wrenching spins for winnings when you play 3-reel, 5-reel, video, and even progressive jackpot pokies. Avalon II, Game of Thrones, Thunderstruck II, Lost Vegas, and Phantom of the Opera are but a sample of what you can experience at your leisure. Of course, there are several hundred casino games at Gaming Club, and they are not all reel-based. You can also hit, split, or double down to beat the online Blackjack dealer, feel the rush of betting on Roulette wheels with Live Lightning Roulette, shoot the Craps dice with Online Craps, back the player’s or the Baccarat banker’s hand, put on your Poker face, pick numbers for a Keno draw, or simply play scratch cards. Play for the biggest casino jackpots with us. Microgaming’s superior software is the reason our online gambling NZ offerings stand head and shoulders above all others. Whether you play on computer or on your Android, iOS, or other mobile device, you are sure to be dazzled by how smoothly our casino online games run. Fair play is ensured by the software provider’s tested Random Number Generator. Also impressive are the graphics and animations, which are supported by unbelievable sound effects. Enjoy action for the digital age at Gaming Club. Backing up the entertainment options at our online casino are New Zealand’s biggest bonuses as well as exclusive promotions. Apart from a hefty welcome bonus, you there are daily, weekly, and monthly special offers, and there is a rewarding loyalty club. Use credit cards such as Visa and MasterCard, or Skrill, Neteller, other e-wallets, Paysafecard or other prepaid cards, or other methods, as well as our encrypted banking service to play for real money. If you need to contact player support, it is available 24/7 on live chat and email. Experience the best with Gaming Club.